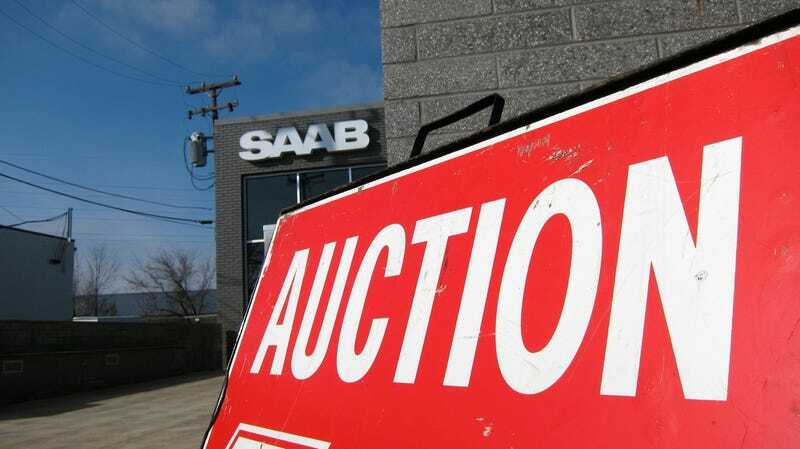 Last week I attended the bankruptcy auction at Saab's U.S. headquarters outside of Detroit and witnessed the last moments of an automaker up close. It turns out the disposition of an automaker's assets is anything but orderly. No, it's more like grave-robbing. I arrived at Saab's headquarters a few minutes before the listed 9:00 AM start time of the auction this past Thursday. The building that housed the Swedish automaker after it was sold to Spyker Cars looks like someone took an industrial supply warehouse and injected it with a load if dot-com cool. That's actually not far off from the mark. In its many lives, the building was one of several used by Nakota Industries, a now-defunct automotive supplier. It was later used by a custom framing shop and then sat vacant for several years before being picked up by a high-end construction firm. Now the building's industrial heritage is barely apparent —filled with glass corridors, wood panels and oozing a high-tech feel. It's also, for the first time since parent company Saab Automobile filed for liquidation on Dec. 19th in a Swedish bankruptcy court and Saab Cars North America suspended operations, oozing with people. The lobby's filled to capacity with folks ranging from semi-professional bankruptcy auction scavengers to curious community members who work nearby to me, the one lone journalist. The "auction" wasn't much of an auction. One expects an auction to be orderly — and in a bankruptcy, one expects there to be rules designed to help engender the highest possible bid. That wasn't the case here. Instead of an auction it was more like a fire sale — as groups were led through the now almost empty headquarters on a first-come, first-serve basis. If someone in one of the first groups bid for an item, if it met the reserve price, it was theirs. That meant that not only was anyone who showed up late totally screwed, but it meant that the auction company wasn't going to be making very much money. Luckily, I was able to glom on to an early-arriving group by promising I wasn't coming in to bid — only to observe. Our group was led to the back of the facility and a multi-car garage filled with what was left of the dead Swedish brand's U.S. headquarters worldly possessions. There were stacks of tires, rims, testing equipment and even a couple of engines. It was there that our group descended on the carcass of the automaker like vulture, looking for whatever tasty morsels we could scavenge. I saw a pristine crated Saab H engine sold for a couple hundred dollars. Next to the crated H engine was a two-arm engine hoist — each arm holding a GM turbo V6 engine. The two engines, hoist and all went for just a few hundred dollars to the guys from Motor City Resales Co.
Across from the engines were boxes of transmissions in God only knows what condition, and front bumpers for Saab 9-5s. They went for a few hundred dollars each to the same guys. There were boxes and boxes of marketing materials, tool chests and the sort of odds and ends that I guess you would expect to find in the remains of a tiny car brand. There were also boxes of shaving cream. I'm still trying to track down the specifics of why those were there. But what I do know for sure is that they went for $25 to a couple who own an eBay auction store called The Part Crib. Walk through the gallery above to see what it looks like when you rob the grave of an automaker.